Drivers are set to travel on the Brian Clough Way in the East Midlands. The naming of a major road through the East Midlands in memory of the late Brian Clough now has the backing of the four councils involved. There is support from fans and councils for the Derby to Nottingham part of the A52 to be named as Brian Clough Way. Football supporters said signs must be prominent to make it worthwhile. Authorities along the route said it will be a fitting tribute to the Derby County and Nottingham Forest manager who died in September from cancer. The details still have to be worked out, such as how the road signs would look, and where they will be mounted. Nick Sellors, of the Rams Trust, says they will need to be prominent to make the project worthwhile. He said there is no point in "weedy" signs that no one can see. 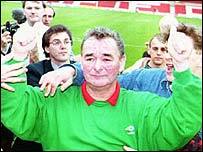 There are also calls for a posthumous knighthood for Mr Clough, with a petition handed in at Downing Street last month. "There is a massive gap in our lives"